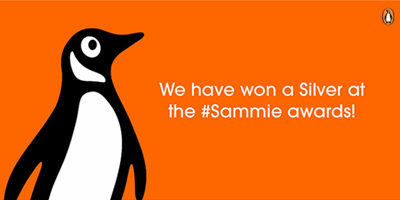 Penguin Random House India has been honored at the Sammie Awards for the second year in a row. Our New Delhi colleagues won the Silver Award in the “Best Social Media Brands – Content Publisher” category. The Indian online platform Social Samosa, which presents the awards, researches trends and developments in social media marketing. “We’re thrilled to have our work be honored amongst other prestigious brands for the second year in a row. Here’s to the gold in years to come,” said Rukun Kaul, Penguin Random House India’s Digital Lead. Penguin Random House India has launched numerous properties via its social media channels, ranging from the web series “#Bookish” to content on its website Penguin Digest. PRH India has approximately 600,000 followers on Facebook, about 161,000 on Twitter, and roughly 70,000 on Instagram. The group’s most successful videos of this year include a short film that explains the publishing process of a book – from the perspective of a book (or the videos in which the publishing group presents authors or discusses traveling with them. The Indian online platform Social Samosa monitors, discusses, and researches the trends and developments in social media marketing. The Sammie Awards recognize the online presence of various India-based brands in different categories and annually honors the best among them with gold, silver, and bronze awards.